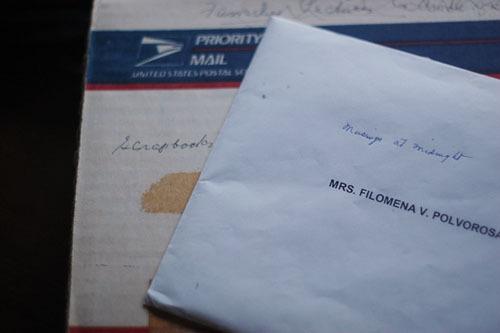 Last night I was sifting through my grandaunt Filomena's journals. She left them for me when she passed away in 2007. 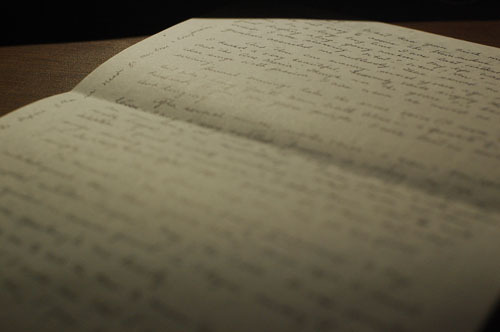 This is a memory that I always enjoy reminiscing and I don't know if I'll ever write it down accurately enough but I felt like touching the pages of old notebooks and snippets of little notes scratched on newspapers and postcards she labeled "musings at midnight". The scent of time passing were on the pages and the dust that's collected between them. They reminded me of old libraries and wood paneled walls. She was a widow with no children to her name and all she can held dearly of her life was her one great love. His name was Telesforo Polvorosa, a troubadour who swept her by the feet and showed her the world. Her parents was not so happy about the relationship because he was a divorcee. But her heart was drawn and she never let go. I often wonder about what God would've thought about my grandaunt's life. 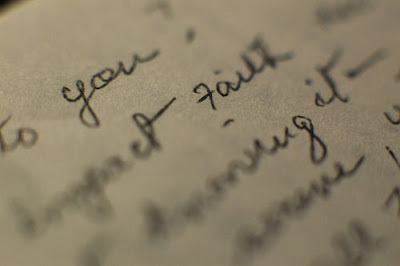 I remember watching her crooked fingers as she showed me her notebooks and told me, "I don't know who to leave these to because nobody seems to enjoy them as much as I do, but it looks like you do." As she lay on the hospital bed during my last visit to her I was surprised at her lucid statement, "Please pick up your things in my house. They are in the cabinet by the living room. Don't forget your things." On the way to airport that afternoon I saw an image of her in my mind. All young again and singing her favorite songs in her lovely soprano. I knew she would pass soon enough. Five days after I left my hometown we got a call that she was gone. I wrote about 6 letters to her and she always wrote back. She was one of those people who consoled me in times of confusion and aloneness. She was one of those people I would turn to when I needed to sift a lot of things inside me. She made it feel comfortable to wade in all these reminiscences and memories. They say she lived in the past too much and never got to live in the present. I don't know. I think she loved her past and it made her endure the present while waiting for her next bus home. A precious legacy. I value the cards and letters I have from my late maternal grandmother, written in her distinctive, flowing cursive. I also love to keep one of her rosaries in my pocket. A precious one indeed. I've been waiting for divine inspiration to start her memoir for the longest time. But never got around to it. It remains a great big frustration of mine. What was your grandmother like? hi Kathy! you and Rachel are blessed to have with you memoirs of your late grand relatives. i've kept some of my mom's too. she passed away last year and her letters give me much comfort and keep her memories alive. I wish I would have known my grandmother better. But my family moved a considerable distance away when I was only four years old, so much of my communication with her was long-distance. She passed away over two years ago, on her 83rd birthday. She lost her father when she was a very small child, and she and her younger sister were raised by their mother (my great-grandmother, Claire. I was given her name as my middle name.). She grew up in the midwestern United States, worked as a secretary for a brief time as a young woman, and married my grandfather, an engineering student. They eventually moved to California, and raised a large Catholic family of 10 children (my mom was #6). Unfortunately, my grandfather died when I was only a year old. My aunts and uncles tell me that he and I would have had much in common. Apparently, he loved to read, and kept a large personal library. He was very interested in learning more about his faith. I think about my grandparents often. I pray for them frequently, and ask them to pray for me as well. Sometimes, the veil separating this dimension from eternity feels very permeable indeed. @aobibliophile: Yes we are blessed indeed. I wish I can really do something about them. What was your relationship with your Mom like? Mine is pretty weird as of the moment but my inclinations in writing are inherited from her. @Rachel: You talk so intimately about your family and I admire that. So much of who I am right now has really been infuenced by such a tight knit family. My maternal grandmother was a Tertiary Carmelite and I remember her always wearing brown. I also remember the huge scapular she wore. She has so many books on the Carmelite mystics which explains my fascination for them. She passed away 2 years ago which was a very sad time. But her life has grown even larger such that it has created such an impact on me and my cousins. I wear her locket around my neck right now. She used to pin it on herself along with some crosses and medals before she went to bed. @Kathy my mom and i were very close and her loss has been deeply felt. i was with her every day & hour during the last month of her life.